Earlier in 2017, Lady Gaga’s drone-backed Super Bowl halftime show left audiences in awe, many of them marveling at the state of the technology and wondering where the future was headed.But while Gaga’s aerial performance was a first in the public’s eye, it was clear it wouldn’t be the last. Drones are entertaining, and they are here to stay. 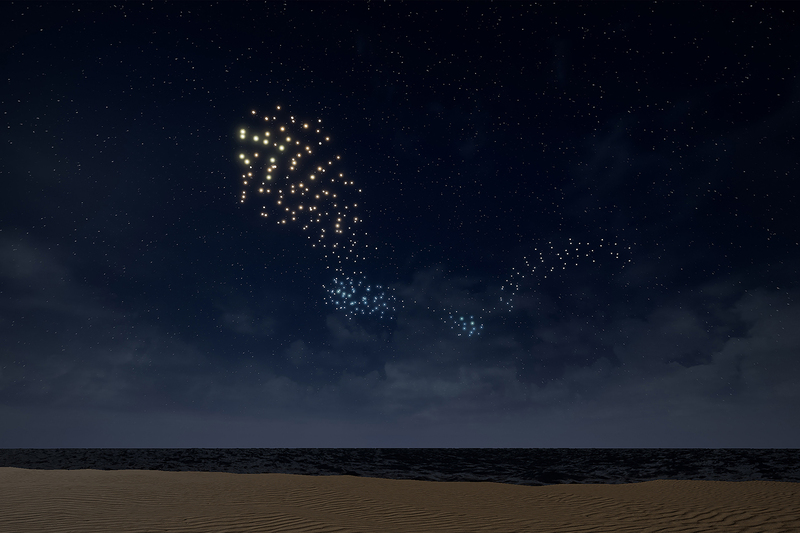 Dutch artists Lonneke Gordijn and Ralph Nauta of Amsterdam based Studio Drift, have teamed up with BMW to bring a drone-based performance piece to Miami Beach during Art Basel, one of the world’s premier art fairs. The flying sculpture will comprise hundreds of illuminated drones in one of the largest demonstrations of its kind. The project was inspired by starlings and the beauty of their swarm behavior. Each bird reacts instantly to the movements of all their neighbors to function within the swarm. At the same time, every individual is trying to get to the middle of the group. The drone performance is designed to imitate starlings in flight and, if all goes as planned, it’s sure to stand out from other pieces at the fair. An algorithm with built-in variations — Cool! The performance is set to take place in the skies over Miami Beach on December 6 at 9 p.m.